Do you remember the last time the Panthers played in Seattle? It was last October, still early enough in the 2015 season that no one was sure if the Panthers were for real. They went into CenturyLink Field having lost four straight to the NFC-standard Seahawks. Then, Cam Newton delivered a thrilling comeback, rallying his team to a win with two 80-yard touchdown drives in the fourth quarter. The Panthers, suddenly, looked like championship material. And so did their franchise quarterback. How things have changed. The Panthers left Seattle on Sunday night embarrassed, not just from the 40-7 drubbing at the hands of their conference foes, but because that same quarterback didn’t want to wear a tie with his game-day outfit and was benched for the opening series. Carolina Panthers quarterback Cam Newton. It was a bizarre turn in a puzzling 4-8 season for the Panthers, who can finish no better than .500 after last year’s 17-2 ride that took them all the way to Super Bowl 50. They are all but assured of missing the postseason in what will be one of the more disappointing follow-up seasons in recent history for a team that lost in the big game. The same can also be said for Newton, the reigning league MVP. Last season felt like a true coming of age for the No. 1 overall pick in 2011. Newton seemed to have matured into a quarterback who could lead his team to a Super Bowl title. And he nearly did. But ever since his infamously terse post-game press conference in the minutes after losing to the Broncos, many of his actions have chipped away at that progress. Is Cam Newton the quarterback we thought he was last season? This is why Ron Rivera’s benching Newton, however briefly, is significant. 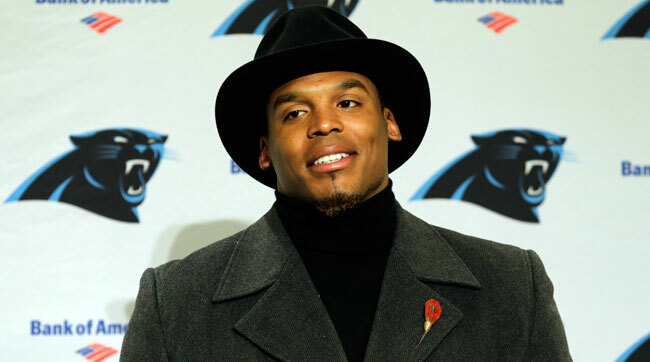 The head coach denied any underlying meaning to his decision, explaining simply that a rule was broken and that he penalized Newton like he would have disciplined any other player. But he also admitted that he knew the benching would spark a “feeding frenzy.” That kind of attention is what Rivera has gone to great lengths to protect his quarterback from in the past, even to the point of suggesting that losing teams shouldn’t have to sit for press conferences after the Super Bowl. On Sunday, he called him out in the most public kind of way for the kind of offense that doesn’t usually draw a penalty beyond a fine, at least not for a first-timer. That’s not to draw a straight line from that game to the Panthers’ losing record this season. But Newton’s decision not to use that film as a learning experience was surprising to opposing coaches—especially considering that many opponents have borrowed the Broncos’ approach to containing him. “It’s my strong impression,” former Panthers GM Bill Polian said, “that the blueprint the Broncos showed everyone in the Super Bowl is what defenses are doing [against him] this year.” Namely, being aggressive but disciplined in their pass rush to contain him in the pocket. “That’s where his mechanics deteriorate,” Polian added. “You hear about him throwing off his back foot. His footwork is curtailed when he’s hemmed in the pocket.” That results in throws that are high and off target. Newton’s completion percentage is at a career-low 54.7% this season. In last year’s MVP season, Newton scored 45 touchdowns; this season, in the 11 games he’s played, he has 19. There have been plenty of problems around him, too, most notably a rash of injuries on the offensive line. In the Week 13 game at Seattle, only one of the five starting positions was manned by the same person who played in that spot in Week 1. The struggles are intertwined: more pressure up front, less yards on the ground, a less productive offense. The most critical adjustment Newton might have to make, however, is not on the field. Rivera sent a strong message that, as much as he has supported and backed his quarterback through deserved and undeserved scrutiny, he is not afraid to make a public stand. Well, only Newton and Rivera know exactly the message the coach wanted to send. But this much is clear: there’s more to it than just the tie. 1. Dallas (11-1). LW: 1. With Washington’s loss on Sunday, the Cowboys became the first team in 2016 to secure a playoff berth. With a win against the Giants this week, they’ll clinch the NFC East. 2. New England (10-2). LW: 2. As per usual this time of year, the Patriots’ only real remaining race is that for AFC home-field advantage. In my opinion, they have a slightly easier remaining schedule (vs. Ravens, at Broncos, vs. Jets, at Miami) than the Raiders, who have three remaining road AFC West contests. 3. Oakland (10-2). LW: 3. The fact that Derek Carr can pull his team out of a 24-9 deficit and deliver a convincing win against a tough Bills team is why he’s my leading candidate for MVP. Carr has a 120.8 passer rating in the fourth quarter. You can never count the Raiders out of any game. 4. Seattle (8-3-1). LW: 4. The caveat to Seattle’s dominant performance was the season-ending injury to Earl Thomas, perhaps their most vital defender. You saw the difference without him in the lineup in Seattle’s loss last week in Tampa. 5. Kansas City (9-3). LW: 5. The Chiefs can move into first place in the feisty AFC West with a win against Oakland on Thursday. Accordingly, the gates to Arrowhead Stadium are opening seven hours and 25 minutes(!!!) before kickoff. 6. Detroit (8-4). LW: 8. That was a playoff-caliber defensive performance by the Lions, who held Drew Brees without a touchdown pass at home for the first time in 61 games. 7. Denver (8-4). LW: 6. They hope Trevor Siemian can return this week from a foot injury. If he doesn’t, the Titans, fresh off their bye, will be a tough game for rookie Paxton Lynch. 8. Pittsburgh (7-5). LW: 12. I’ve been down on the AFC North the last few weeks. But this past weekend, both the Steelers and Ravens looked like teams that could catch fire if they get into the playoffs. 9. Baltimore (7-5). LW: 13. Four touchdowns, 381 passing yards. Joe Flacco’s biggest offensive explosion of the season, just in time. 10. Atlanta (7-5). LW: 7. The Falcons came up with a new way to lose on Sunday, the pick-two. That was a crushing home loss, which allowed the resurgent Bucs to pull even in the NFC South. 11. New York Giants (8-4). LW: 9. The Giants’ offensive struggles are summed up in this stat (h/t Newsday’s Tom Rock): The Giants’ average time of possession after 12 games is 26:50, worse than every team in the NFL except the 49ers. 12. Tampa Bay (7-5). LW: 14. I can’t believe this is the same Bucs team that lost 43-28 to the Falcons on Thursday Night Football four weeks ago. The Falcons have a more favorable schedule down the stretch, but the Bucs have won some tough games over the last month. 13. Washington (6-5-1). LW: 10. Jay Gruden reportedly unloaded on his team after the loss, for good reason. They lost a winnable game with too many of their own mistakes. 14. Miami (7-5). LW: 11. Decembers haven’t been kind to the Dolphins in recent years, and this one is off to an inauspicious start. A Ravens offense that hadn’t been particularly effective for most of the year cut up the Dolphins defense. 15. Green Bay (6-6). LW: 15. The Packers haven’t exactly been playing world-beaters on offense the past two weeks, but improved defense has definitely been a factor in back-to-back wins that keep their postseason hopes alive. 16. Minnesota (6-6). LW: 16. 17. Tennessee (6-6). LW: 19. 18. Indianapolis (6-6). LW: UR. 19. Buffalo (6-6). LW: 17. 20. Houston (6-6). LW: UR.